Try School Bus Manager Free for 30 Days! It's a full account - there are no limitations. No credit card, no contract - no obligations. Support is always free - we love to help our users. Invite your whole team - so everyone can test it out. Private and secure - data is yours, and we back it up daily. Fill out the form. We'll call you to configure a few simple settings and enable your account. Output an XLS or CSV file from your Student Information System and import directly into School Bus Manager. We will even import your first data file for you for free! 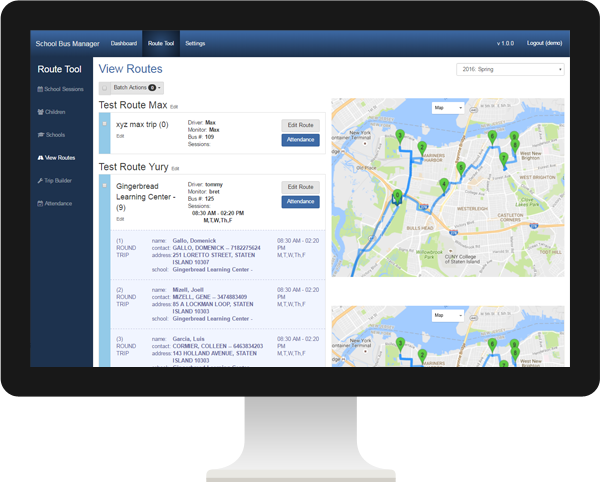 We can teach you how to build routes in 30 minutes or less, output turn-by-turn directions, take attendance, and more! School Bus Manager is the simplest school bus routing program on the market today. With just a quick import of your student data and configuring a few simple parameters, it enables users to build trips and routes with turn-by-turn directions, accurate stop times, take attendance, and more. School Bus Manager is designed for all skill levels. It’s web-based so it requires no installation, fully compatible with both PC and Mac, plus it’s Mobile Friendly. Powered by Google, you won’t need to buy maps, and since it’s cloud-based its always up to date and your data is always safe. It’s a very POWERFUL school bus routing program at a very AFFORDABLE price, requiring no big upfront investment, designed to suit any size district or operation. Because it eliminates the need for routing buses by hand, it streamlines your transportation operation, saving you money, time and errors, while increasing your profitability and efficiency.